Former Assam Chief Minister Tarun Gogoi. 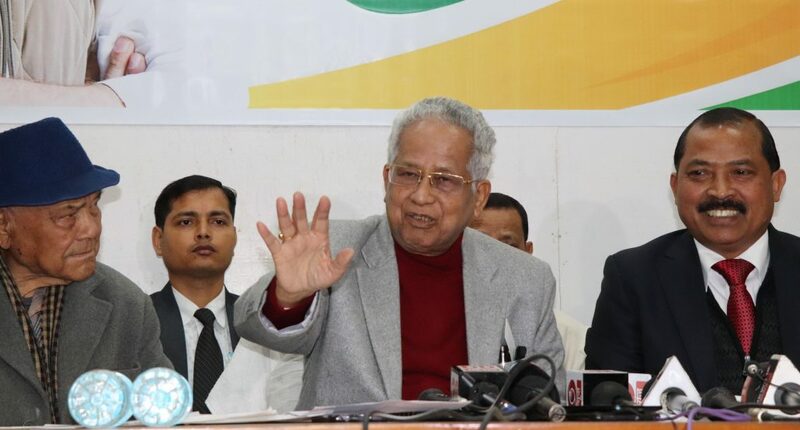 Congress veteran and former Assam Chief Minister, Tarun Gogoi who was in Shillong to campaign for the party ahead of ensuing Assembly elections said on Saturday that this time the election in the State is a fight of ideologies. Gogoi also said BJP is good at making false promises. “They have promises to make Meghalaya a model state, whereas they are still to achieve the feat in Gujarat,” he said. Criticizing the Narendra Modi led government at the Centre, the former three-time Chief Minister of Assam said the country has witnessed sky-rocketing of prices of essential goods during the regime of the present government like never before. Gogoi further said that the concept of ‘achche din’ is only applicable to the BJP leaders and not for the common man. While equating the country to a beautiful garden, Gogoi taking a jive at the BJP said, a garden cannot have only ‘lotus blooming’. Highlighting that it was the Congress that has introduced Sixth Schedule of the Constitution to the north-eastern states, Gogoi exuded confidence that the party will emerge victorious and will form the next government in the State. The former Assam Chief Minister also laid stress on solving the boundary dispute between Assam and Meghalaya at the earliest. While appreciating the fact that both the states have not gone to court to resolve the issue, Gogoi said an amicable solution can be arrived at by making minor adjustments to the areas demarcated during the creation of Meghalaya.